An argument over loud music led to a man being attacked with a seven-inch hunting knife, a court heard. 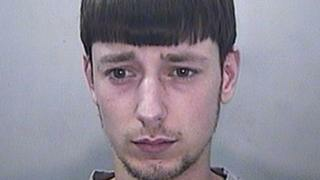 Keiron Parker, 21, stabbed a neighbour in the head, back and bicep in the early hours of 3 June. He was jailed for seven and a half years after admitting causing grievous bodily harm and possessing an offensive weapon. Cardiff Crown Court heard how both men had been to a party and returned to their homes at South Walk, Barry. The 42-year-old victim said Parker had run out of his house with the knife to confront another neighbour who was playing music loudly. Concerned what he would do, he tried to calm the defendant down. But Parker then turned on the other man, and inflicted injuries which required surgery. Police said the victim still has no feeling in two fingers and that he was unable to work. "The injuries, particularly the wound to the head, highlight how serious an assault this was and the victim could easily have lost his life," said Det Con Matthew Lea. "Knife crime is unacceptable. Carrying a knife is a crime, even without using it."